EMBARK ON THE MOST ADVANCED AND COMPREHENSIVE SPECIALIZATION ITALIAN WINE COURSE BAR NONE! The Italian Wine Scholar™ education program is an Italian wine course designed to provide committed students of wine with the most advanced and comprehensive specialization study program on Italian wine bar none! It was created by native Italian, Maurizio Broggi, DWS, FWS with the support of the Italian wine DOC/G consortia. 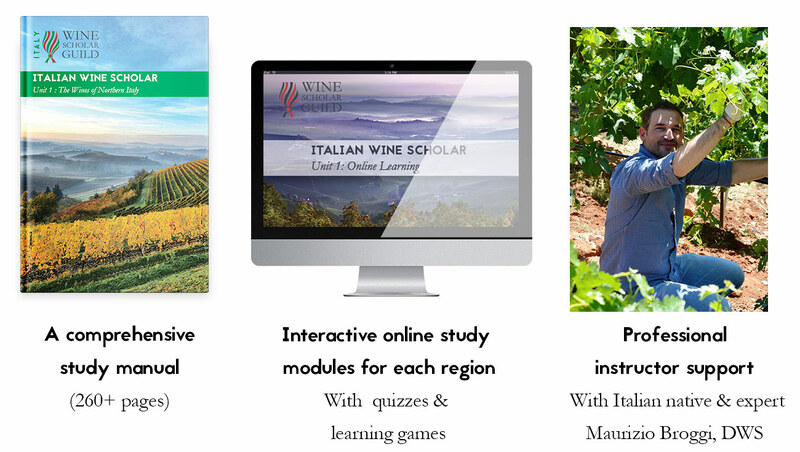 The Italian Wine Scholar™ curriculum via online learning offers an interactive program that is put into a measurable, meaningful format designed for maximum retention of content and ease of use. Students of wine who follow this in-depth curriculum and pass the exam for Unit 1 and Unit 2 will earn the Italian Wine Scholar™ (FWS) post-nominal. "I am impressed by the thoroughness of research that has gone into the Italian Wine Scholar study manual, and by the clear way it is laid out"
The 260-page, full-color study manual provides all the information from which the test questions are derived. You do not need to research you own study materials; everything you need to know is in the manual. The IWS online study modules offer interactive presentations that are put into a measurable, meaningful format designed for maximum retention of content and ease of use. Each region of Northern Italy are covered and dovetails nicely with the Italian Wine Scholar study manual Unit 1. Study materials are available 24/7. If you’ve got a laptop and an internet connection, you’ve got a classroom! 1. To drink and speak like an Italian by learning about the iconic grapes, and appellations as well as hidden gems that only Italian knows. 2. To Specialize! Many in the industry have general wine credentials. The Italian Wine Scholar program allows you to set yourself apart by acquiring an advanced-level, focused skill set. 3. To enhance your working knowledge of Italian wine by understanding the impact of history, the significance of geological events, the importance of topographical markers and the influence of climatic factors on the wine in the glass. 4. To become more confident at buying and cellaring Italian wines by studying how the wines are made and labeled. 5. To tackle challenging theory exams from WSET, Society of Wine Educators and Court of Master Sommeliers. 6. To start your vinous exploration if you are considering working in the wine industry. Many reference France and Italy as the benchmark for wine production. 7. To enhance your value to your employer! Wine professionals that invest in professional development tend to perform better at their job and get recognized for it. "I am very impressed with the first edition of the Italian Wine Scholar Unit 1 study manual which is well researched and thoughtfully laid out." What information is covered in the course/study manuals? Why is advanced Italian Wine Study so complex? Although an Old World country, Italy is younger than the United States. Unification of the Italian peninsula occurred in 1861. In the centuries prior to Italian unification, Italy was divided into a plethora of small kingdoms and city-states. Each of these political entities shaped the history, people and culture of their region; for this reason, studying Italy is akin to studying the wine production of 20 different countries--each one with its own grapes, wines, food and traditions. Are there any pre-requisites to enter this program? While not a pre-requisite, we recommend that students have successfully completed, at a minimum, one of the following programs before enrolling in the Italian Wine Scholar program: WSET level 2, Certified Specialist of Wine (CSW) or Court of Master Sommelier’s Introductory Sommelier Certificate (Level 1). Why invest in certification ? The era of self-professed wine experts is long over. Professionals need credentials. Certification is resume-building, validates competency and serves as a point of distinction midst trade and peers alike. "I have devoured the Italian Wine Scholar manual and found it incredibly well written, precise and comprehensive. I think it will be a useful and great tool in the hands of many Italian wine lovers and wine professionals across the country that want to learn and understand more about Italy, and its geography, history, culture and definitely wines." "I have devoured the Italian Wine Scholar manual and found it incredibly well written"
"I am very impressed with the first edition of the Italian Wine Scholar Unit 1 study manual which is well researched and thoughtfully laid out. The dense information is well organized and includes graphs, color photographs and wine labels, making it both visually appealing as well as informative. Given the sheer amount of information, it is a great idea to divide the course material into regions. I would recommend the Italian Wine Scholar study program for anyone who really wants to learn about the complex and fascinating wine regions of Italy." "I am very impressed with the first edition of the Italian Wine Scholar Unit 1 study manual." "Committed students of wine will love the Italian Wine Scholar manual. It’s exhaustive coverage of Italy’s regions, grape varieties and wine styles will only make you thirsty. Plus, extensive use of images, labels and detailed maps helps bring everything to life." "Committed students of wine will love the Italian Wine Scholar manual..."
"I am impressed by the thoroughness of research that has gone into the Italian Wine Scholar study manual, and by the clear way it is laid out. I am sure that this course will prove very useful for the growing numbers of wine students wishing to improve their knowledge of wines in general and Italian wines in particular." "I am impressed by the thoroughness of research that has gone into the Italian Wine Scholar study manual"
"I was very excited to read your first foray into Italy…it did not disappoint. Once again, you have compiled a wine manual that is truly scholarly. The Italian Wine Scholar manual is comprehensive, complete and very well structured. Your format of starting with the history, moving to topography and climate, explaining in depth the grape varietals and ending with thorough explanation of the appellations is seamless. You have obviously done your homework and compiled the right scholars to help create this wine manual. With the online program, the different avenues for learning this information, all available through your course, is truly remarkable. From video with your Italian expert (Maurizio Broggi DWS, FWS), to videos on the book material to going through power point slides, is really fantastic. It permits all students to learn through different teaching techniques. Whether it is maps, video, power point or just reading, this course contains it all." "I was very excited to read your first foray into Italy…it did not disappoint!" "The Italian Wine Scholar study manual on the wines of Northern Italy is simply the finest guide to this complex and important region to be published in recent memory. It is an immediate must for the trade at all levels and for any interested consumer. Bravo!" "An immediate must for the trade at all levels and for any interested consumer. Bravo!" "In one word, the first edition of Italian Wine Scholar Unit 1 study manual is …..“Exceptional”! It is the most comprehensive study guide I have seen on Northern Italy. With the impeccable detail that is provided within each region it allows the student to truly master Italian wines. From an educators perspective, separating the program into two units allows the student to fully embrace comprehend Italy. Bravo!" "In one word, the first edition of Italian Wine Scholar Unit 1 study manual is “Exceptional”!" "The information is comprehensive, the writing is engaging and the format is easy to follow. Congratulations!" "The Italian Wine Scholar study manual is a comprehensive compilation of information for those who are truly interested in mastering Italian wines. It is tightly edited and focused, with a great collection of maps and other graphics as well." "Thanks so much for sending Unit 1: The Wines of Northern Italy. I’ve had the chance to look over it, and I have to say I really like it. It’s well-organized, well-written and very informative. It’s a superb resource to study and dig deep into the wines of Northern Italy. I’m looking forward to your release of Unit 2!" "It’s a superb resource to study and dig deep into the wines of Northern Italy"
"The Wine Scholar Guild has created an impressive and comprehensive curriculum in the ever-changing and always complicated world of Italian wine. I loved how the book(s) were laid out with good, relevant, timely information and how easy it made learning about Italian wine. The information is presented in such a way that the program is appropriate for beginning and advanced students of wine. Bravo – well done!" "WSG has created an impressive and comprehensive curriculum in the ever-changing and always complicated world of Italian wine"
"For the student of wine no country is more challenging to learn than Italy. The scale of regions, grapes, and styles of wine is overwhelming. 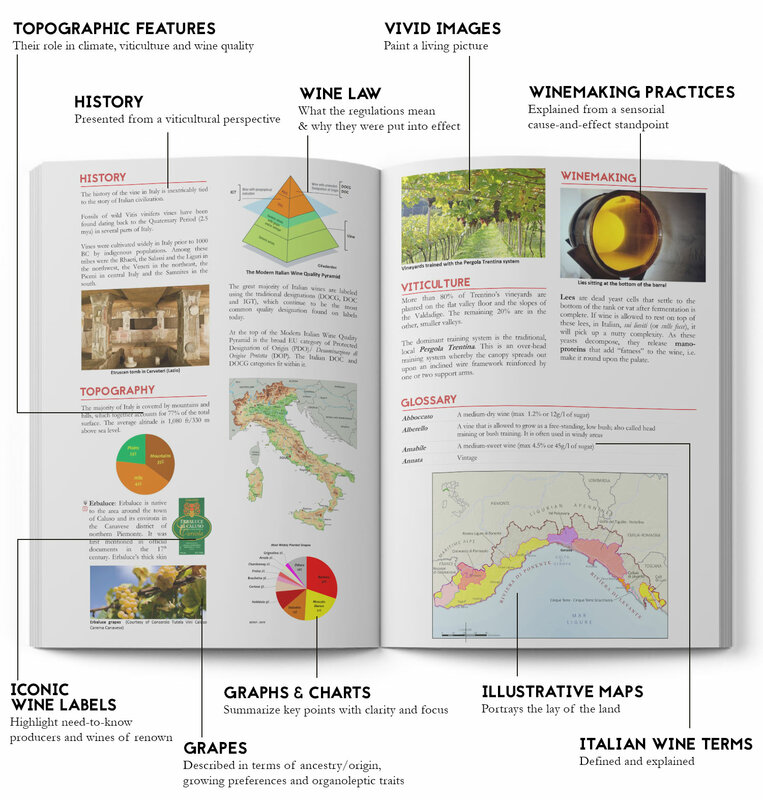 A thoughtful and concise manual like the Wine Scholar Guild’s “Italian Wine Scholar Unit 1” can be an invaluable tool vital to a student’s success in learning about the world’s most diverse wine country." "...an invaluable tool vital to a student’s success in learning about the world’s most diverse wine country"
"This book is a must have for anyone seriously interested in getting to grips with Northern Italian wine regions, the main DOCs/DOCGs and most importantly the rich wealth of native grape varieties. The book is very clearly set out, making this complex subject accessible and easy to read. The layout is simple to follow with brief paragraphs covering each region, its history, climate, soils and sub-zones as well as wine styles, key grape varieties and DOC/DOCGs. I particularly like the beautifully illustrated regional maps with demarcated DOC/DOCGs at the beginning of each section. Plus the addition of lots of well-chosen photographs of vineyards, landscapes and wine labels helps bring to life the huge depth of technical and factual information this book contains. This is one of the most useful and accessible sources of reference material on Italian wines to be published recently which makes this invaluable for both the wine professional and dedicated enthusiast alike." "Invaluable for both the wine professional and dedicated enthusiast alike"
"This is a scholarly work that is amazingly approachable and accessible, especially considering its comprehensive, encylopedic nature. It exhibits an exquisite attention and precision to detail that is extraordinary. Also rich in historical context fleshed out by informative, fun facts and trivia, it presents an enjoyable journey through the intricate, convoluted maze that is Italian wine." "a scholarly work that is amazingly approachable and accessible, especially considering its comprehensive, encylopedic nature"
"The first edition of the Italian Wine Scholar Unit 1 study manual is rich in details and a great read"
"The manual is superb, and has been very helpful to us. Especially the “Foundation Chapter”. We have used it extensively to better understand the Laws, especially recent changes and the EU impact on these changes. 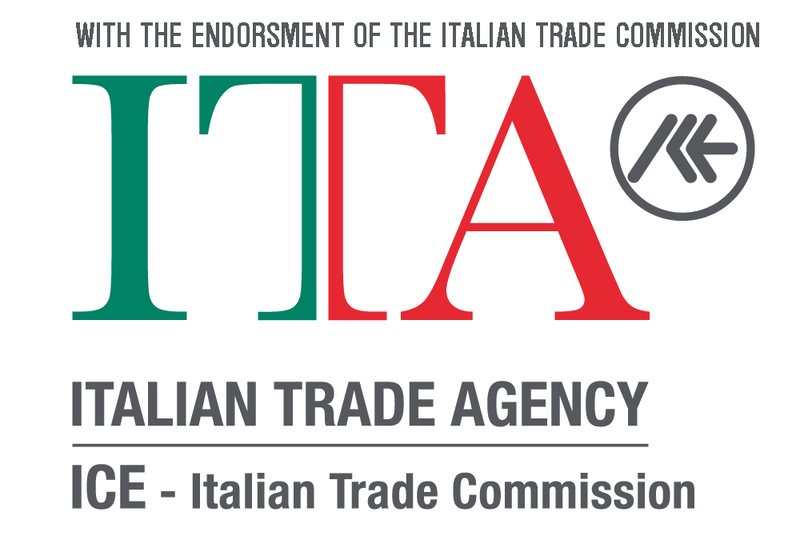 We are extremely proud to be the importers of several important Italian producers, with new ones coming into the fold almost every month! Gaja, Il Poggione, Anselmi, Berlucchi, Nino Franco, Cusumano, Nonino, Simonit & Sirch, and just recently, Feudi San Gregorio. Angelo and Gaia Gaja have elected to change the nomenclature on several of their labels with the most recent releases, so this information from your extensive and well-put together research has been invaluable in understanding these changes. The maps, photographs and illustrations are very well done, and help keep the material fresh and fun to read. Italian wine is a complicated topic and your fine work cuts through what could be an overwhelming course of study and makes it very approachable. Cheers to a fantastic job on this. I sincerely hope we get to meet in person someday so I can thank you directly." "Thanks to its complex orogenesis, topography and climatic variation, Italy boasts a combination of distinct terroirs and the largest number of indigenous grape varieties—some well-known and established, others lesser-known and even endangered. Through the comprehensive Italian Wine Scholar manuals, the student of Italian wine is able to dive deeply into the diverse world of the wines of Italy and appreciate how the vine is intrinsically part of the Italian landscape and deeply rooted in Italian culture." "Through the comprehensive IWS manuals, the student of Italian wine is able to dive deeply into the diverse world of the wines of Italy"